Pearly everlasting is a perennial native plant (in Canada and the U.S.) that is a member of the Asteraceae family. It is drought tolerant and a favourite food source for many butterflies. Pearly everlasting was often used medicinally by native North American Indian tribes who used it as treatment for a range of ailments. It has been used as a remedy for diarrhea and dysentery. 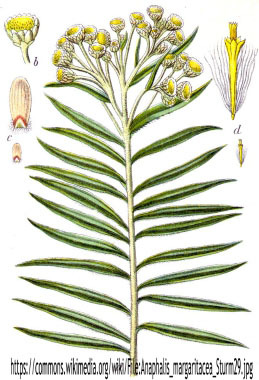 An infusion of the plant is steamed and inhaled in the treatment of headaches. 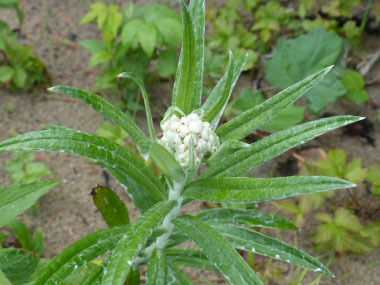 Distinguishing Features: This plant is easily recognizable; it has small white button-like flowers with yellow centres. It forms a bushy mound of hairy silver-gray foliage but the flowers are easy to identify. One salient feature is that the undersides of the leaves are covered in tiny hairs, giving them a woolly feel and appearance. The stems are dry and brittle. 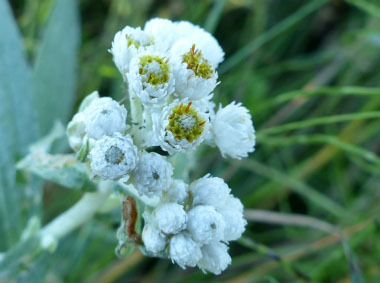 Flowers: Pearly everlasting flowers are generally flat-topped clusters of numerous 0.5cm to 1cm (¼ to 1/3”) flower heads at the top of the plant. This plant has male and female flowers, usually on separate plants. Male flowers are globular with numerous slender, erect yellowish brown staminate flowers in the yellow center disc. Female flowers are globular to egg-shaped with a yellowish to dark brown bristly ring around the top of the flower head. Both genders have what appear to be numerous tiny white petals in many layers around the centre (bracts). The bracts on the female flowers do not spread out much until seed starts forming. Flowers bloom July – October. 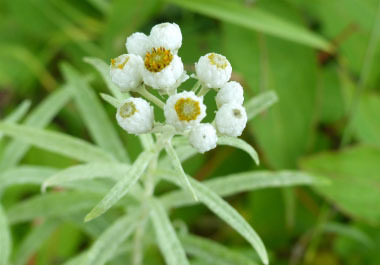 Fields of Nutrition has medicinal benefits and vitamin/mineral content of Pearly Everlasting. Leaves: Leaves are 7 to 13cm (3 to 5”) long, and up to 2cm (¾ inch) wide. They are toothless, often with wavy or rolled edges, covered in white woolly hairs on both sides but moreso on the underside. Pearly everlasting leaves are sharply pointed at the tip with no leaf stalk. They grow alternate. Height: This plant can grow anywhere from 30cm to 1 metre (1 to3') tall. 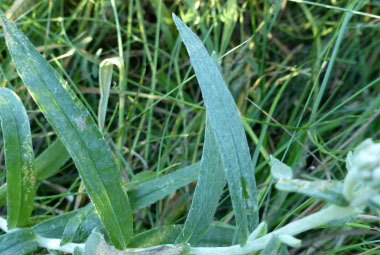 Stems are densely covered in woolly white hairs. Habitat: Pearly everlasting prefers growing in sunny locations althoughtit can be found in part shady areas as well. It likes dry fields, along roadsides, disturbed soils, and the edges of wooded areas. This plant grows in Canada, the U.S., several countries in Europe, India, Japan, eastern Russia, South Korea, China and in several areas in the Himalayan Mountains. Edible parts: Young leaves are edible when cooked. 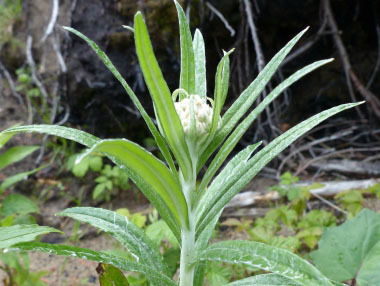 Other name: Western Pearly Everlasting.